October 5th I will be at the InD’Scribe Con & Book Festival leading a panel discussion on writing steamy passages. Fellow panelist Suzan Tisdale is a USA Today Bestselling Author, storyteller and cheeky wench, who writes Scottish historical romance/fiction, with honorable and perfectly imperfect heroes and strong, feisty heroines. And bad guys she kills off in delightfully wicked ways. Since December, 2011 when she published her first novel, Laiden’s Daughter, she has published fifteen titles, with two more being released in the spring of 2017. To date, she has sold more than 350,000 copies of her books around the world. They have been translated into four foreign languages (Italian, French, German, and Spanish.) You will find her books in digital, paperback, and audiobook formats. With such a wealth of material, I recommend exploiting one that is currently free, and awarded 5-stars by InD’Tale ezine. Ian Mackintosh and his bride, Rose, return to McLaren Lands to rebuild all that was destroyed by the previous laird. Believing bad times and evil men are behind them, they’ve let their guard down. Ian’s world is turned upside down one cold winter’s night when Rose is kidnapped. 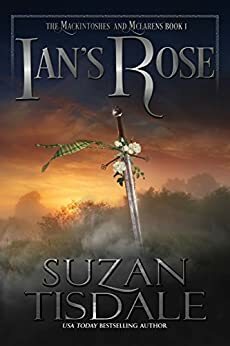 For those who must start a series at the beginning, Ian’s Rose is the first of the Mackintoshes & the McLarens, a follow on series to the Clan Graham set; Rowan’s Lady and Frederick’s Queen. He built impenetrable walls around his heart…. The Black Death showed no mercy when it took Rowan Graham’s beautiful, young wife. With his clan nearly decimated, his heart torn to shreds, he is left to raise his newborn daughter alone. Rowan tries to keep the promises he made to Kate on her deathbed, save for one: He is unable to give his heart to another. She has built walls around her own… Lady Arline is forced into yet another arranged marriage — loveless and lonely. Behind Garrick Blackthorn’s good looks lies a cruel, vindictive man. She wants nothing more than her marriage to end so that she might gain the freedom she has longed for. Fate will bring those walls tumbling down…. 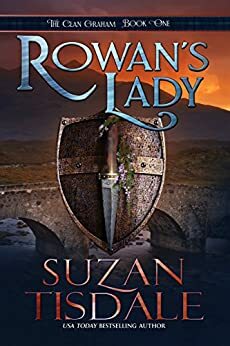 Rowan Graham is surprised to learn that his enemy’s wife is a woman he met but for a few short moments seven years earlier when dark times had fallen across Scotland. The same woman who had helped insure the freedom of his foster father and brother has been risking her life to care for his daughter. Fate brings them together…but others are determined to pull them apart.